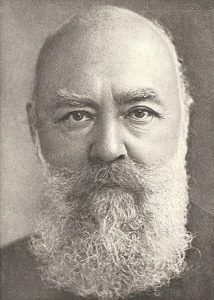 Christoph Friedrich Blumhardt (1842-1919) was born at Möttlingen in 1842. Christoph Blumhardt, as his father, Johann Christoph Blumhardt, became known as a mass evangelist and faith healer. The preaching of the Blumhardt’s was radically oriented toward the coming kingdom of God. For a time Christoph Blumhardt was involved with politics as a Social Democrat, but came disillusioned with politics. He gradually developed the idea, that the most radical and active involvement in the world is in fact in waiting upon God. Christoph Blumhardt’s theology, preaching and ministry influenced important theologians of the 20th century, such as Karl Barth and Jürgen Moltmann. According to Blumhardt the purpose of God’s judgments was the conversion of the sinner aiming at the final salvation of all.